Step 3. Go do a survey! Step 4. You get your report with photos, text, and data in tables - it’s that simple! Clarinspect does it your way. You can have any fields on your App, and Clarinspect does not constrain the order in which you do work. Add details about penetration, or safety feature, add photos and annotations. Unlike other systems, Clarinspect adapts to your way of working and delivers a report as you want it, in your corporate style in Word or PDF. As one of the inspectors told us - "I can now spend longer on site doing a more thorough job because Clarinspect writes my report with all my photos". Because they can spend more time on site we can rest assured that the buildings they are involved with are being built to a higher level of quality. Works online and offline, work saved all the time! Clarinspect improves the field information gathering (samples and observations) and then compiles your report for you with all photos put in the correct places, sized and formatted ready for you to tweak the report adding the benefit of your expertise. Save between 50% and 75% of the time you spend on manual inspections. We have one client who is saving 4.5 hours per report by using Clarinspect. What would you do with that saving? Example of slab pre-pour inspection. An example of the Health and Safety report that is created. Note that the output tailors itself depending on the answers given in the field. App: First part of the construction monitoring form has details about the job. App: This is a generic form, so you can choose the category of inspection you are undertaking. App: There is a basic example of a Health and Safety form. This is used to produce a separate H&S report in PDF that is sent to a manager, or team leader. 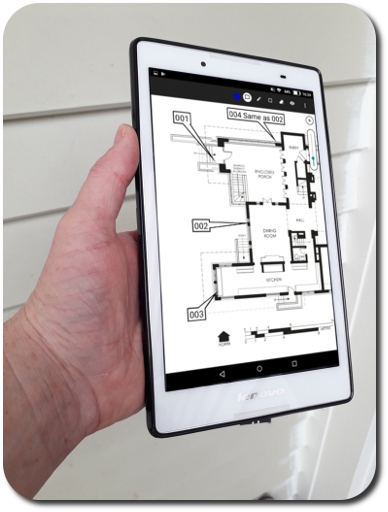 App: The engineer in the field adds observations, each of which has photos and areas for recording notes, instructions and variations. Problem report, issues management - this form is to support insurance or property damage. Click for sample report (docx). Example of an issue as presented in the sample document. You can change layout easily to suit your needs. App: The initial page captures the location, reason, and background to the visit. App: Detail of an observation. describe the issue, set the type of issue, and action required. Take upto 3 photos. App: Same observation form showing hte current options under type of issue (in this case how the problem should be resolved). Simple layout for showing the facts around a registered hazard. Click for sample report (pdf). App: Basic hazard register that can be built into your main Inspection or act stand-alone. Three photos per hazard. GPS location also. Generate completed reports and deliver them to your customers in record time.